In the midst of the holiday madness, you may be tempted to grab the first item in your line of sight on her wish list. Whether her ideal gift is jewelry, a designer handbag, or just a plain cute accessory item, this move would not be advisable. Even if she provides you with a descriptive wish list, there is still room for some major oversight when deciding on the perfect present for your special someone. Here are some tips to ease your holiday shopping experience. One question worthy of consideration is how much you should spend on her? Well, this answer is not so clear cut. However, a wise way to approach this dilemma is to consider how invested you are in the relationship with this woman. Are you casually dating, in a long-term relationship, married, or just friends hoping to be more? The amount of money you spend on her should be relative to the current relationship status or to the extent of where you plan on taking the relationship. For instance, if your relationship with her is only in the blossoming stage, then a very expensive and extravagant gift would imply that you have very serious intentions towards her such as a long-term relationship or even marriage. On the other hand, if you are only casually dating, and you would like to take things slow, then an inexpensive but sentimental gift would be more appropriate. A second consideration is how invested is she in the relationship? Do you perceive that she will be with you for the long haul, or are you just her companion until something better comes long? 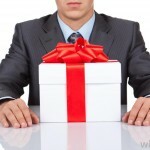 If you are not sure, then to play it safe, buy a less expensive gift. Save a more extravagant gift for when you are sure her heart is already yours. After deciding on an appropriate price arrange for your gift, you can more carefully consider what she would like. Here are some considerations concerning the most common gifts that women like. Women may insist that huge rock-size accessories are what they adore. However, when choosing jewelry as a gift, you should consider what will actually look good on her as opposed to just buying the biggest, most sparkly accessory you can find. Women with slimmer or petite bodies are more suited for daintier pieces of jewelry. For example, necklaces with finer chains or a pearl necklace with smaller pearls. The same concept applies to earrings and bracelets. Rings may be the only exception to this rule. On the other hand, medium-built to larger women will look nicer with more solid pieces of jewelry. Most women can never have enough handbags. If it is a designer handbag, then that is even better. Taking a glance around her wardrobe or observing which brands she usually carries will clue you in on her favorite brands. When choosing a handbag, the size principle that I previously mentioned also applies here. If she is a shorter or slimmer woman, be sure to choose a bag that is small to medium size. A large bag will engulf her, making her appear awkwardly small. On the other hand, when shopping for a medium-built or heavy-set woman, avoid small handbags. Small handbags will magnify her size and will hardly flatter her in the least. In terms of color, new-arrivals handbags will be in the seasonal colors. However, if you are looking for cheaper bags found on the clearance rack, keep in mind Christmassy colors such brown, dark green, burgundy red, navy blue, gray/metallic, and of course, black. Moreover, you should also consider her personality and personal taste. Some of the guidelines that I just mentioned above may be completely void depending on her personal preference. A woman’s age can be told by the scent of her perfume. Light, misty, or floral scents are most suitable for younger women, particularly women under 30, or women with exceptionally childish features. Musk or spice scents are best for older women or women with mature or edger features. Since girlhood, girls have liked to collect items from dolls to stuffed animals to glass what-nots. Collectibles are a great gift alternative, if you wish to give your woman something nice and special but nothing too expensive. The dilemma that follows this alternative is that you must know her personality well enough to know the kind of collectible she would really adore. You can look for hints around her personal space (house, car, office, etc…), ask her friends, or tag along with her as she does her Christmas shopping. I was tempted to omit this one, because it is just too complicated. In short, unless you are married or are living together, stay away from buying her clothing. If you buy something too small, she will feel embarrassed. If you buy something too big, she may think that you are intentionally suggesting something that you are not. And if she just doesn’t like it, then she will never wear it. The only expectation is if you are strictly buying her an accessory like a scarf or a hat or another item that is one-size-fits –all, which suits her personal taste. If you are confident about her taste and style, then by all means, go for it! Lastly, if you get stumped along the way, it never hurts to ask another woman’s opinion. Female store associates love to help and even other female shoppers will eagerly share their advice, so take advantage it. Happy Holiday Shopping!